Rose Hill Cemetery is located in northeast Shenandoah at the intersection of Carter Street and Argus Road. The original owners were R.A. Crippen and J.N. Denison and the ground was platted 29 May 1872. In 1876 the cemetery was taken over by David Sanborn Lake and William Noble. In 1880 David Lake, founder of Shenandoah (Lake) Nurseries, sold his half interest to his brother, Arthur S Lake. Arthur Lake came into the possession of Noble's interest that same year, and became the sole owner. 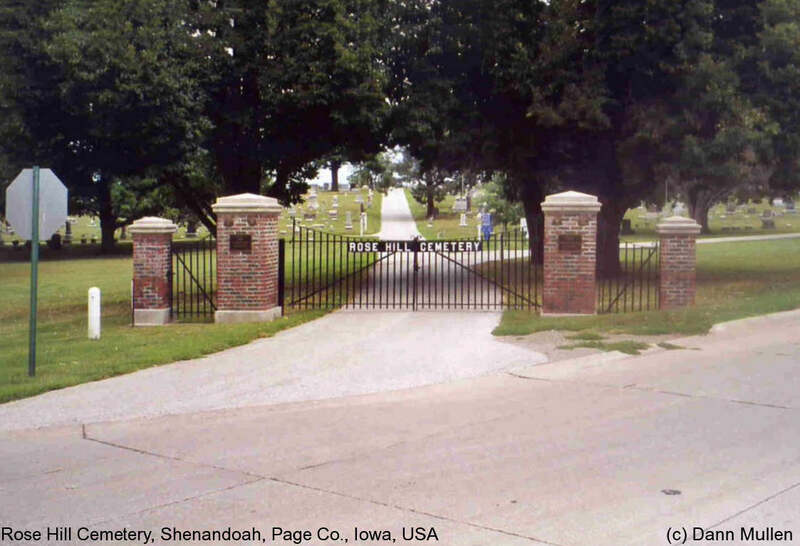 The city of Shenandoah obtained the cemetery on 27 Sep 1916. The Original Section of the cemetery is designed in the shape of a wagon wheel, the plots and rows going out from a hub in spokes to a wheel rim. In 1911, the Relief Corps of Shenandoah erected a granite monument to honor unknown soldiers who died in defense of their country. This monument is located in the hub or center where the spokes converge. Originally the walkways formed seven "spokes" in the wheel. The Original Section can be complicated to navigate as more burial space was required, and walkways disappeared. This design was a deviation from the usual practice of laying out burial spaces east and west. The cemetery has developed several "traditional" additions: 1st Addition, 2nd Addition, Rose Hill Park, Memorial Park, and Southview. Potter's Field was located on the extreme northeast part of the cemetery and at one time there were over 200 graves. Now there are very few stones in this area.